Founded in 1890 in Helsinki, since 1978 a state owned special library. 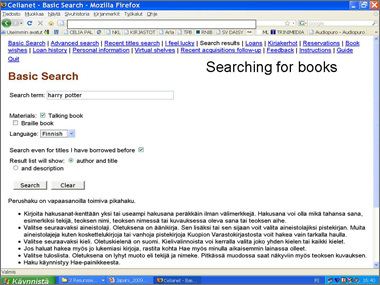 Only library of its kind in Finland. 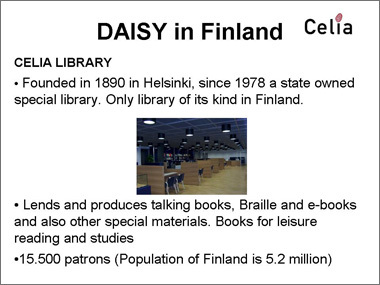 Talking book collection of 23.000 DAISY titles. 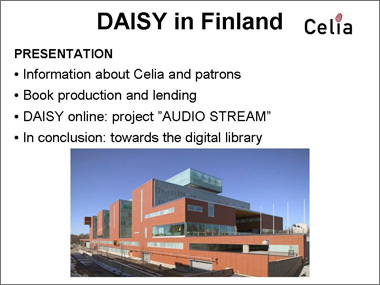 Celia has digital studios for recordings and also buys books from other producers. 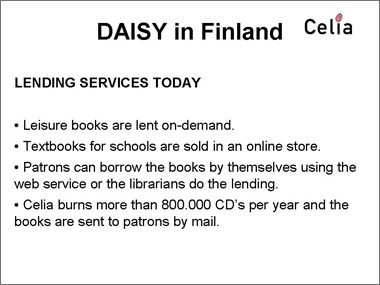 Library hopes to use DAISY for e-books in the near future. 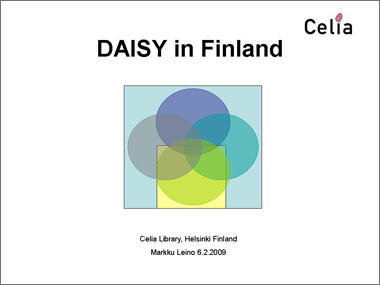 The aim for all production is to have one DAISY format master file and to produce all distribution copies from that file. Leisure books are lent on-demand. Textbooks for schools are sold in an online store. 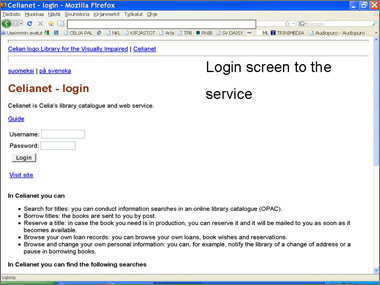 Patrons can borrow the books by themselves using the web service or the librarians do the lending. Celia burns more than 800.000 CD’s per year and the books are sent to patrons by mail. 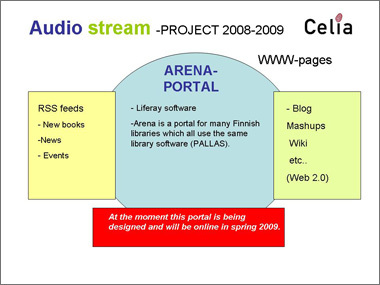 From 2009 patrons can also listen to the books online. 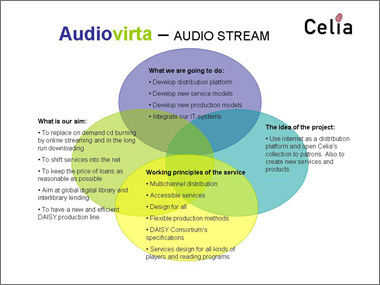 The online lending project ”Audio stream” is our newest way of offering better services to our patrons. Use internet as a distribution platform and open Celia’s collection to patrons. 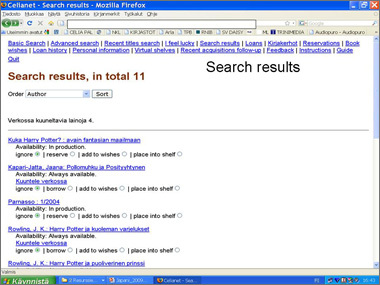 Also to create new services and products. 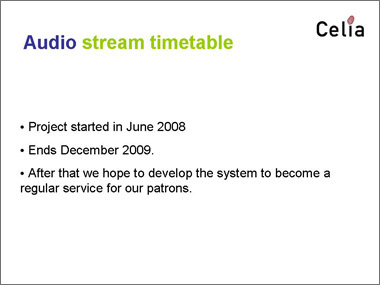 After that we hope to develop the system to become a regular service for our patrons. 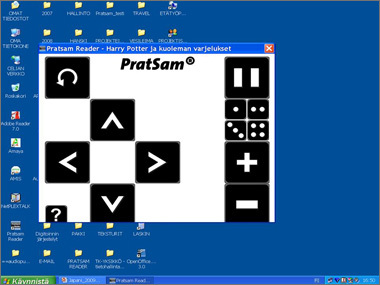 The patron has a pc and reading software. He logs into Celianet and borrows the books he wants. The system gets the files from the archives and transfers them to a distribution server and the patron can start listening. 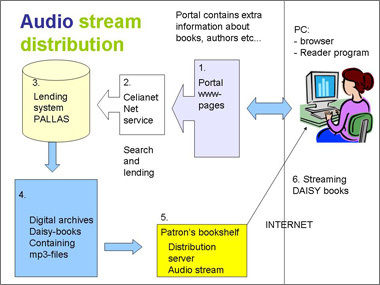 The patron has a DAISY player, he can contact the distribution server and start listening. The books in this model are usually selected by library staff. 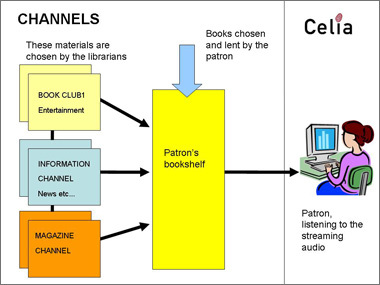 Patron can also call Celia and ask the for the books he wants. 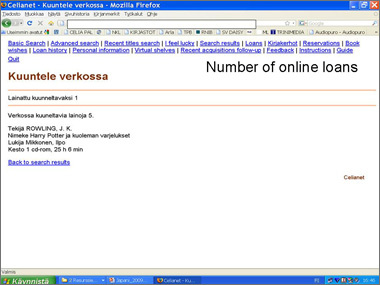 Librarians use the system for lending the books and the files are transferred to listening as stream. 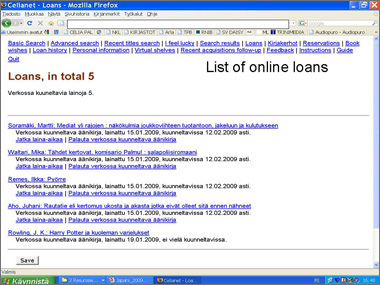 Arena is a portal for many Finnish libraries which all use the same library software (PALLAS). At the moment this portal is being designed and will be online in spring 2009. Celia's aim is to build a digital library where all products and processes are as efficient as possible. 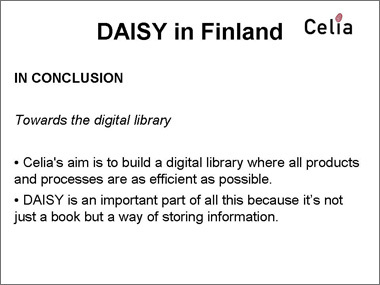 DAISY is an important part of all this because it’s not just a book but a way of storing information. 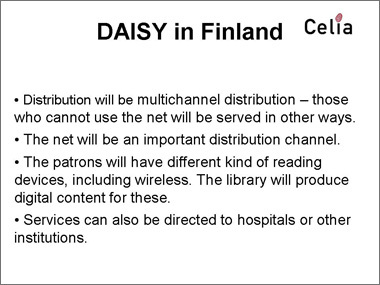 Distribution will be multichannel distribution - those who cannot use the net will be served in other ways. The net will be an important distribution channel. The patrons will have different kind of reading devices, including wireless. The library will produce digital content for these. Services can also be directed to hospitals or other institutions. 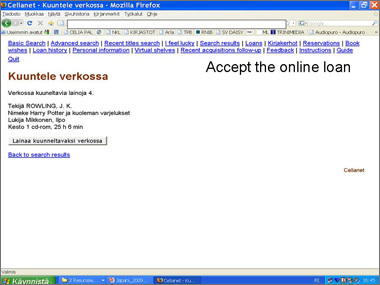 All services in the net have to be accessible. International co-operation is essential. Daisy Consortium's tools and ideas make sure that you don't have to invent the wheel twice.